It is situated at the border of Daya District and the Situn District of Taichung City. 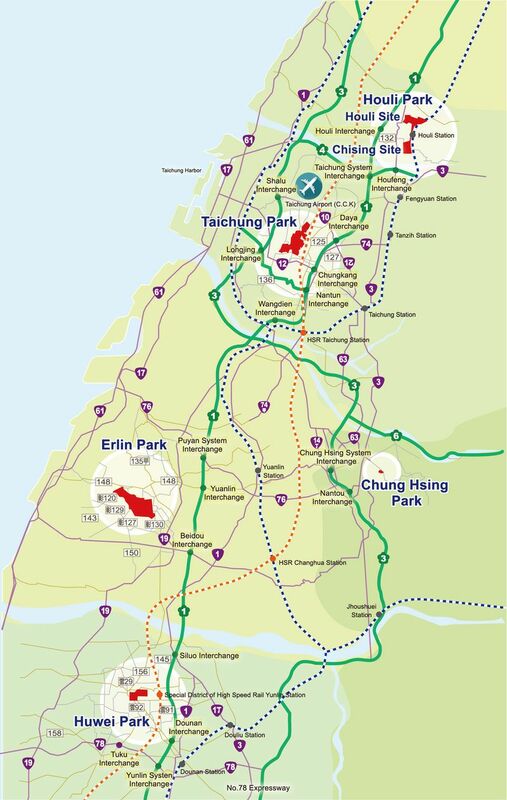 The Park is 13 km away from Taichung Railway Station, which is about a 30-minute drive. The Park is 12 km away from Taiwan High Speed Rail Taichung Station which is about a 20-minute drive. To its East are the National Highway No.1 and Taichung-Changhua special highway No. 74. To its West is the National Highway No.3, which is situated at the center of four interchanges of National Highway No.1 and National Highway No. 3. It takes about 10 minutes to drive to the highway. Taichung International Airport is approximately 5 km away from the Park, which is about an 10-minute drive. It is around 14 km from the Taichung Harbor, which is about a 30-minute drive. Location It is situated in the northwest side of Huwei township, Yunlin County. The east side of the base is adjacent to the specific area of High Speed Rail Yunlin Station. Railway System The Park is about 12 kilometers from Taiwan Railway Douliou Railway station, approximately a 27-minute drive. It's about 0.8 kilometers from High Speed Rail Yunlin station (in planning), roughly a 2-minute drive. It is around 57 kilometers from Taiwan High Speed Rail Taichung Station, which is about a 75-minute drive. Highway System To its East is the National Highway No. 1 and to its South is the Provincial Way No. 78. It takes about 20 minutes to drive to the highway. Taichung International Airport (C.C.K) is approximately 70 km away from the Park, which is about an 80-minute drive. It is around 74 km from the Taichung Harbor, which is about a 95-minute drive. Location It is situated in the northern and southern city planning of Houli District in Taichung City, including the Houli Site on the north side and the Chising Site on the south side. The Park is about 2 km from Houli Railway Station, approximately a 5-minute drive. It is around 30 km away from Taiwan High Speed Rail Taichung Station, approximately a 35-minute drive. To its West is the National Highway No.1 and to its South is the National Highway No.4. It takes about 5 minutes to drive to the highway. Between Houli site and Chising site are Provincial Way No. 13 and Houke Road, which connect these two sites..
Taichung International Airport (C.C.K) is around 26 km away and is a 30-minute drive. It is about 28 km away from the Taichung Harbor and is about a 45-minute drive. It is situated on the northeast side of Erlin township in Changhua County, adjacent to Xihu Village and Bitou Township. The Park is about 17 km from Yuanlin Railway Station and is a 37-minute drive. It’s around 37 km away from Taiwan High Speed Rail Taichung Station, roughly a 50-minute drive. To its East is the National Highway No.1 and to its north is Provincial Way No. 76. It takes about 20 minutes to drive to the highway.. It is approximately 55 km away from the Taichung Harbor and is about a 70-minute drive. The Park is about 17 km from Jhoushuei Railway Station and is a 25-minute drive. It’s around 30 km away from Taiwan High Speed Rail Taichung Station, roughly a 35-minute drive. Highway System To its West is the National Highway No. 3. It takes about 5 minutes to drive to the highway. Taichung International Airport (C.C.K) is around 50 km away with a 50-minute drive. It is about 55 km from the Taichung Harbor with about a 60-minute drive.